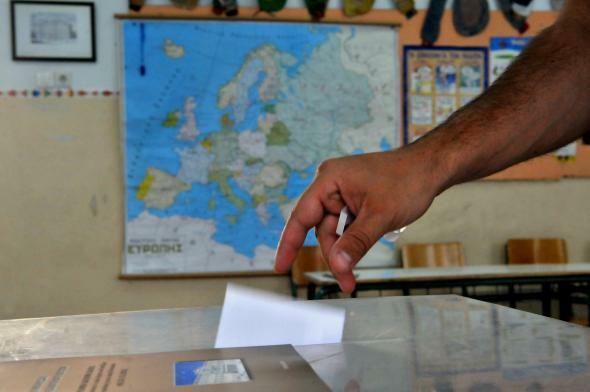 A man casts his ballot during the Greek referendum in Thessaloniki on July 5, 2015. In 2012 the European Union was awarded the Nobel Peace Prize for its record of having “contributed to the advancement of peace and reconciliation, democracy and human rights in Europe.” Bestowed during the darkest days of the euro crisis, the award raised some eyebrows, but it’s not an unreasonable case to make: As a condition of EU membership, formerly authoritarian countries including Greece, Spain, and Portugal and formerly communist countries in Central and Eastern Europe and the Balkans have introduced and strengthened democratic institutions. The problem, underlined by the events in Greece over the past few weeks, is that the EU tends to demand democracy in its members except when it comes to the EU itself. Last week 61 percent of Greek voters said “oxi” (“no”) to a bailout deal that included tough austerity measures that the country’s leaders say are crippling its economy. Now that Greek Prime Minister Alexis Tsipras, compared to a “beaten dog” after an all-night negotiating sessions with EU leaders described as a “mental waterboarding,” has agreed to bailout terms nearly identical to those rejected in the referendum last week, Greeks are likely wondering—not for the first time—what exactly the point of the vote was. The humiliations go further than that. In what Reuters describes as a surrender of “much of its sovereignty to outside supervision,” Greece has agreed going forward to “seek creditor approval for key legislation before submitting to public consultation or parliament.” The country’s creditors now get a say on its laws before voters do. Three years ago the Norwegian Nobel Committee gave the EU credit for helping to put Greece’s tumultuous 20th-century history of juntas and military dictatorship firmly in the past. Now, #thisisacoup is trending on Twitter. For all its democratic trappings, the European project tends to run into problems whenever it’s put to a vote. A proposed EU constitution was scrapped in 2005 when it was rejected by French and Dutch voters. Its replacement, the slightly less ambitious Lisbon treaty, was put to a public vote in only one country, Ireland, which rejected it in 2008. (The Irish eventually voted yes to the treaty the following year after winning some concessions.) The only two countries that held a referendum on adopting the euro, Denmark and Sweden, both rejected it. The EU’s directly elected parliament has ironically been a major boost to euroskeptic parties on both the left and the right, who have taken advantage of voter apathy about the EU. The union will face another major electoral challenge as early as next year when Britain holds its long-planned in-out referendum on EU membership. The polls are still too close to call. The idea of a unified democratic Europe is still a powerful one, as the crowds waving EU flags in the streets of Kiev last year attested. But it’s going to be hard going forward for Brussels to demand its member governments respect the will of their voters when it’s extremely reluctant to apply those standards to itself.